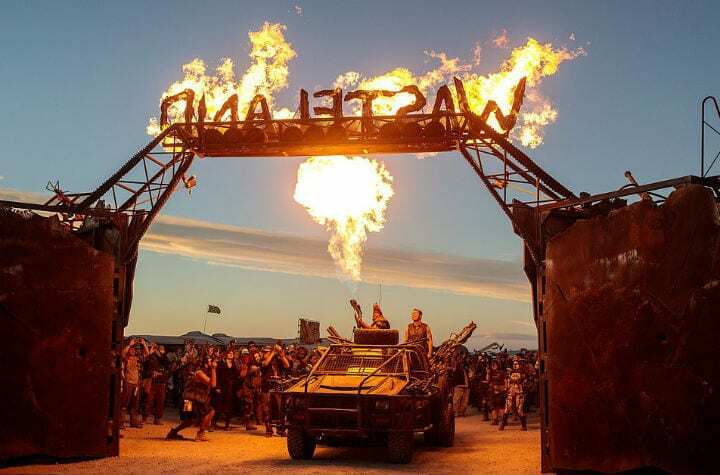 What would any Mad Max homage be without just a little fire? Featured prominently in the previews for Fury Road were characters that ended up being some of the coolest parts of the film: Warboys jamming on electric guitars that spat out flames. As night falls, many of the festival’s anarchic musical acts begin. Fire serves another purpose for this festival. Nighttime in the high Mojave Desert in California can be absolutely frigid and windy, in stark contrast to the sweat and grime of the daytime. The camp fills with trashcan fires, with the different tribes of participants huddled around bonfires to keep warm.